Adventure awaits in your own back yard. You just have to walk out the door and find it! During a recent visit to California, we did just that. 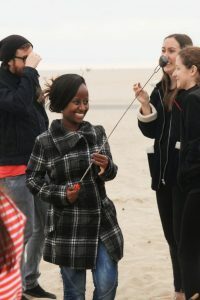 I was honored to accompany my good friend Sera, the budding S’more Model, and her friends during one of their monthly traditions—a campfire on the sandy Huntington beach. After spending the afternoon laughing with friends, roasting marshmallows around the campfire, splashing in the salty sea, and enjoying the perks of being the unofficial taste tester for inventive new recipes, I have decided that this is the life. And, more importantly, this group of people is really on to something. Theirs is a tradition worth having! If you’ve never dined on the delicacy that is the s’more *gasp*, it’s OK… you aren’t totally alone. During our campfire excursion, I was introduced to some friends who had never known the joy of smooshing golden marshmallows and melty chocolate between graham crackers. After introducing them to the Rolla Roaster, they roasted their first marshmallows, and tried their first s’mores. Needless to say, the childlike glee in their eyes was everything. 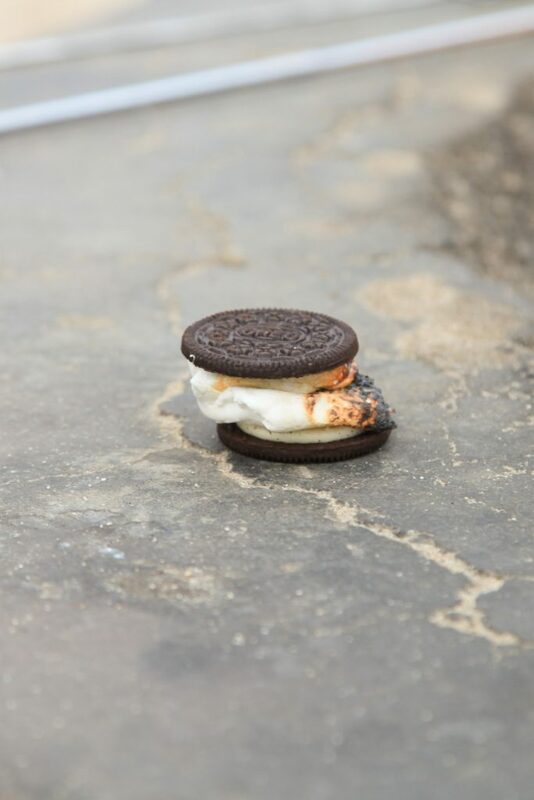 For example, the S’moreo was epically invented by one of Sera’s friends. It’s an Oreo and a s’more (just in case you didn’t catch the mashup). Think about that. Oreo + S’more. No, wait… don’t think about it unless you have a campfire ready. Ah, too late. Welcome to Cravings City, USA! But that’s the beauty of backyard adventures. There’s plenty to do close to home—you just have to think outside the box and break routines. Get out there and start new traditions! 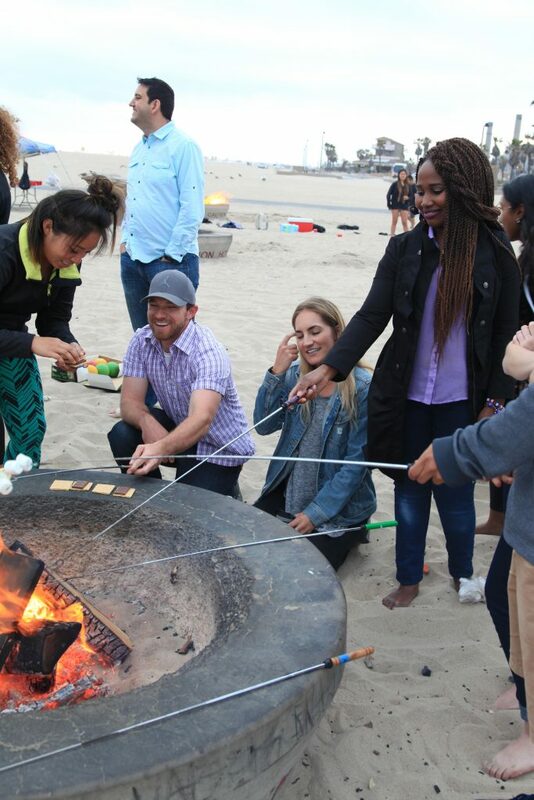 For this fabulous group of friends, that translates to spending time together, roasting s’mores around a campfire… yes, even on the outskirts of L.A. Despite the June Gloom that brought dark skies and chilly breezes, the bravest ocean enthusiasts even ventured out into the frigid waters. With a warm fire and toasty s’mores waiting, they didn’t notice the cold at all. Well, hardly. We laughed. We created. We spent time in the great outdoors. We broke free of monotonous routines. We spent time with friends. We roasted s’mores. All-in-all, I’d say it was a pretty epic day. Thank you Sera and all your friends! I won’t forget it! Check the website for the current deals of this summer. Katelyn Holzer is the talented photographer and free-spirited daughter of the legendary inventor, Bob Holzer. Written by the word-nerd extraordinaire, Becca Storm.